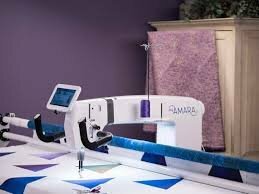 Come Demo a Longarm, or take a class! Indigo blue and light quilts were so very popular in the 19th century and are still a classic today! Mrs. Millers Apprentice features several gorgeous indigo blue prints, as well as many other shade of blue, and a blend of lovely light prints that make the sampler blocks sparkle! It's sure to be a treasured quilt in your collection. Le's get those quilts finished! Learn how to transform your photos into lifelike quilts. 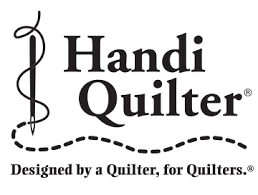 Long Arm quilters interested in free motion quilting and building their ruler tools are welcome to join the club. Also there will be some door prizes so sign up and enjoy quilting time with your friends and meet new friends. Learn to use your Pro-Stitcher for elegant and precise quilting. This class is a pre-requisite to PROGRESSIVE QUILTING WITH THE PRO-STITCHER class. Let's think Spring, time to spread your Wings! Now you're ready to expand and strengthen your skills with Pro-Stitcher. INTRODUCTION TO THE PRO-STITCHER on May 5th is a prerequisite to this class. Want to learn to quilt? This class is specially designed to help you! Learn how to quilt with specialty rulers to easily quilt curves, straight lines and special designs on your domestic sewing machine.